Soil or land pollution is contamination of the soil that prevents natural growth and balance in the land whether it is used for cultivation, habitation, or a wildlife reserve. Some soil pollution, such as the creation of landfills, is deliberate, while much more is accidental and can have widespread effects. ​ Pesticides decrease biodiversity in the soil because they do not just kill the intended pest; they often kill many of the other small organisms present. When life in the soil is killed off, the soil quality deteriorates and this has a knock-on effect upon the retention of water. This is a problem for farmers particularly in times of drought. At such times, organic farms have been found to have yields 20% – 40% higher than conventional farms. Soil fertility is also affected. 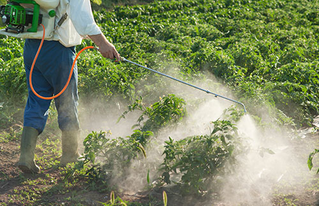 When pesticides kill off most of the active soil organisms, the complex interactions which result in good fertility break down. Plants depend on millions of bacteria and fungi to bring nutrients to their rootlets. When these cycles are disrupted plants become more dependent upon exact doses of chemical fertilisers at regular intervals. Even so, the fantastically rich interactions in healthy soil cannot be fully replicated by the farmer with chemicals. So the soil – and our nutrition – is compromised. We can grow large but watery fruit and veg, which often lacks taste and nutrients and may even contain pesticide residues.